Cycling is a sport that fosters a spirit of familiarity and trust that exists between friends--even with strangers you have never met you already have the common bond of two wheels. Even in competitive racing the riders on different teams work together towards the finish. Can you say the same for football, basketball, volleyball, or baseball? I love riding my bike to meet my lovely friends and I have made new and lasting friendships while cycling! Cycling is a colorful sport and a beautiful sport because the scenery always changes. Look up the word "peloton" (a group of riders in road racing) on search engines and you'll see what I mean. The cycling kits (clothing) is like a box of color crayons or van Gogh in motion! Pedals used to have toe clips and straps, like the one pictured below with Brooke Shields to anchor the feet through the upstroke when pedaling. Now there are "clipless" pedals (a system of cleats on shoes that connect with special pedals so you can just step-in/step-out without needing to tighten/loosen straps). One day I'll explain the pros and cons. Cyclists LOVE coffee. Sure, I can drive to get a cup of Joe but biking to a coffee shop (usually to meet friends) and sharing our lives over cappuccino makes my day even more AWESOME!! I love flying downhill! It literally feels like I am flying. Cycling works your cardio system, your legs, abs, arms, back, core and bum!! I arrive at work mentally alert and in the best mood. I no longer go to the gym where I am stuck indoors "working out" and instead I can enjoy lunch with my colleagues. Cycling is a quick way to get from A to B. I don't have to warm my bike first like I do my car or (drive around to) find a parking space. It takes me about the same amount of time driving to work as it does to bike to work which I'll talk about later. Cycling is a great self-confidence booster. How can I hate the strong and sculpted legs that helped to pedal me for miles and miles? I learned to appreciate all of my body after I rode 35 miles, 52 miles and over 80 miles on my own in just a few hours. Heck--I don't even drive that distance in a day when I do drive! Once I learned and understood racing strategies, cycling became even more enjoyable but it's not necessary to like racing at all. My husband races and I enjoy being a spectator but not all cyclists like to watch bike racing. I never used to like riding up "hills" and as I started cycling more and more, the "hills" became smaller and smaller. Now I find hills and mountains an awesome challenge to ride up. I am pretty proud of myself after I reach the top and look back. It is like hiking uphill but even faster! Seeing a race up close is a rush. You can literally reach out and touch them AND in some races the riders come to you!! Can you say that about other sports?? I mentioned before in 12. that I can go anywhere (the road takes me) and getting lost means a discovery of an alternate route and a new path. It can be fun (if you are on a ride for pleasure). Cycling is a great way to burn calories. My bicycle commute to and from work takes between an hour to 1 hour and 10 minutes in my day BUT IT IS FUN the entire time!! I am not stuck in a car and stuck in traffic. The whole time I am pedaling uphill and downhill, I feel the wind on my skin, my heart pump blood through my body, I smell flowers blooming or the aroma of a BBQ from the backyards I pass by, I am strength training my calves, legs, thighs and bum. So I never feel guilty about indulging in a hamburger or pizza or drinking beer. Cycling is an earth-friendly mode of transportation. Where a car needs fuel to run, my bike needs me -- human and muscle power. At the end of a ride, it is great to have a cold beer ... or sip a glass of wine. Having this much fun should be a crime, LOL!! Feeling the wind in my hair is ABSOLUTE FREEDOM. Riding my bike is simple: a swing of my leg over my bike and I pedal away - instant and sheer freedom. But 99% of the time I wear a helmet to protect my head should the unexpected happen. I know I am a naturally clumsy person and should I fall off my bike, having a helmet on my head can make the difference between getting back on the bike and on my way and a visit to the doctor, which would ruin my day. 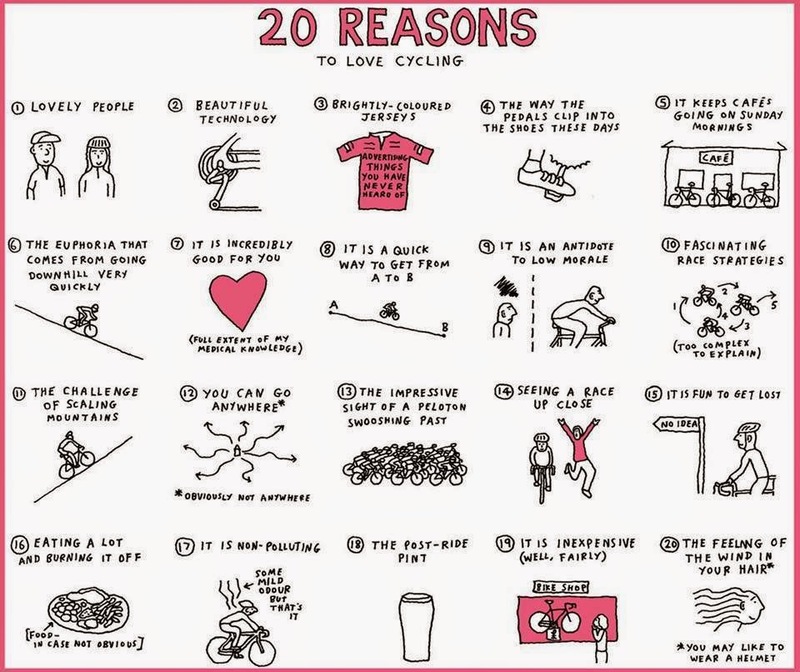 So...what are your reasons for your love of cycling? I know there are more than mentioned! !